2014 was a busy year for Bruno Cathala. Next to Five Tribes and Abyss he also designed Madame Ching with Ludovic Maublanc. Ludovic is known from the games Ca$h and Gun$ and has worked with Bruno before on games like Cyclades, Dice Town and Cleopatra and the Society of Architects. 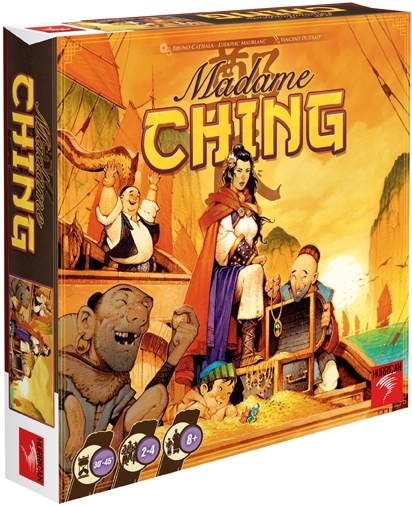 Madame Ching is published by Hurrican games. What is Madame Ching like? Madame Ching is a hand management game at its core, with some elements of set collection and risk taking. Players try to make sets of cards which represent the journeys of their ships across the ocean, hopefully all the way to Hong Kong. Players play navigation cards adding to their journey. 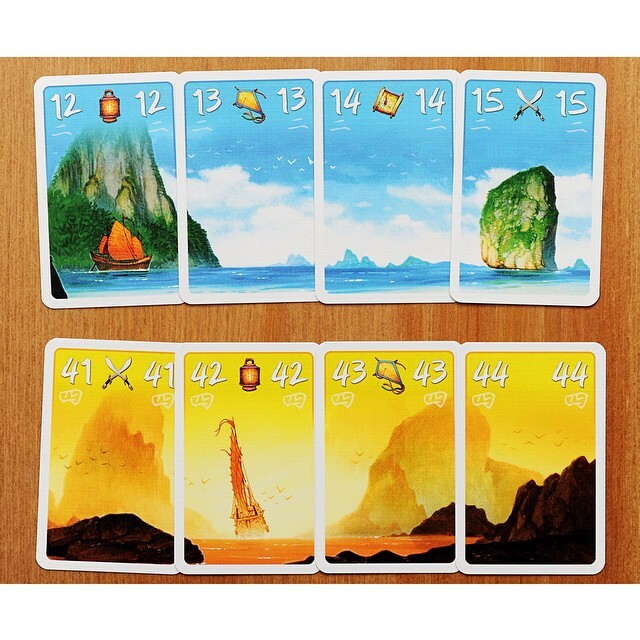 Each card must be of a higher value than the previous one to continue the voyage. 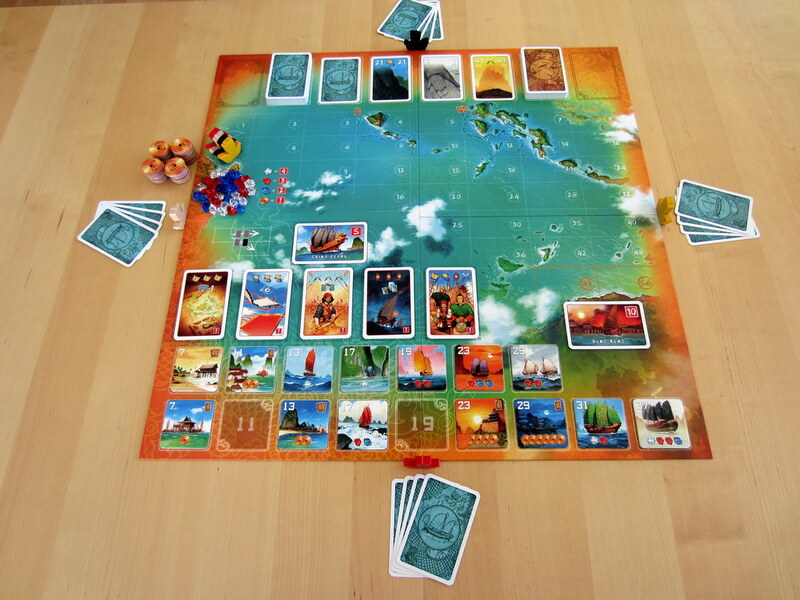 Every time a card is played the player moves their ship on the board. Horizontally if the card has the same color as the previous card and diagonally it it’s a different color. The farther the voyage goes the more valuable ship tile you earn. Some tiles give gems or gold or encounter cards, or a mix of them. Additionally players try to collect icons on their navigation card that match the skill cards. These skill cards give a powerful abilities throughout the game. Once a player has collected all four skill cards that player earns Madame Chings ship the China Pearl and the game ends. Players draft new cards for the sets in a similar way to Ticket to Ride, and this has the same feel. Actually Madame Ching is on that same family-friendly level as Ticket to Ride in my opinion. Everything is beautiful illustrated by Vincent Dutrait, which adds a bit to the flavor and theme. The truth is that despite the nice art work and the little wooden ships the game feels a bit mathematical. The encounter cards add a bit of take-that, for instance, there is a card that lets you remove a navigation card from your opponents voyage and one that lets you trade a card in hand with an opponent. The game doesn’t really need this and this can create some potential harsh moments. But that’s personal. Also some of the encounter cards are way stronger than others so there is quite some luck involved there. Awesome looking game with nice components. I had high hopes for this game and the game kind of delivered. It has a nice feel to it and there are some strategies to be found and some interesting tactical decisions to be made, but sometimes a certain colored navigation card won’t show up for you and can have some bad luck in the card draws. There is also one encounter card which lets you draw three encounter cards, which is ludicrous. I play with the rule that this card lets you draw three but keep one to balance it a bit. Overall a good game with some replay value. The fun in this game is in completing long voyages and scoring the big points from the ship tiles, but also trying to collect all the skill cards. Reusing the the skill cards with the Grizzled Sea Dog encounter card is also fun and powerful play. The goal of reaching Hong Kong is also nice and makes me come back to the game because I still haven’t managed to get all the navigation cards right to do this. It’s like the holy grail of the game and won’t be reached in every game. The theme of a pirate ship on its voyage is a bit pasted on and the game is quite mathematical. But somehow you do feel emerged in the whole pirate theme due to the artwork. One word: Stunning. Vincent Dutrait doesn’t disappoint. The components are all top notch. The rules are a bit wonky, but the game is eazy to play actually. Once you get the mechanics it goes very smoothly. The rules for two players are a bit different than for three or four. I actually enjoy it most with two players.